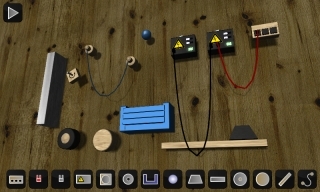 What gadget would you build with these materials? Build a complex machine to perform a simple task in Apparatus, an addictive, brainteasing game for your Android phone or tablet device. The only limits are your creativity and the laws of physics as you create mechanical structures that send marbles rolling toward a final goal. 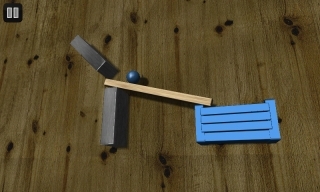 You’ll begin the game with a few objects and a single goal: to send your marble rolling until it lands in a blue, bucket-like container. You’re free to build any kind of machine you want with the materials you’re given, and creativity is essential. 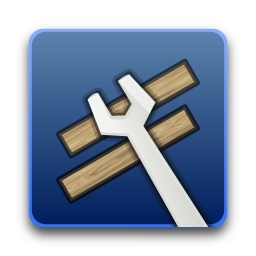 Use the hammer or wrench to connect wooden planks, wheels, and other objects. Connect cables from batteries to motors, build bridges, set up teeter-totters, swing with ropes, build vehicles, or just give the marble a convoluted, Rube Goldberg-style roller coaster ride. 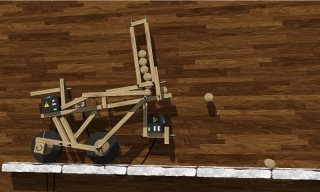 Want to create a fabulously complex mechanism for moving the marble a few inches? Or maybe you’d rather make a sleek, efficient structure that allows your marble to travel a long way in as few steps as possible. It’s all up to you. Once you’ve constructed a machine, just touch the “play” button at the top of the screen. This will get the ball rolling, and you’ll see how your creation stands up to the test of physics: if it’s not stable, or the marble’s progress gets obstructed at some point, you’ll know immediately that your machine needs more work. There are two ways to play Apparatus: you can progress from level to level, like in a standard video game, or you can eschew all convention and go straight to the Sandbox for freebuild mode. In conventional play, the early levels teach you how to play the game and go through some basic concepts. The more you progress, the more freedom the challenge levels provide; many levels can be solved in many different ways. Of course, they also get more difficult as you go along. If you don’t have the inclination (or patience) to face the challenge levels, why not just play around in the Sandbox and build whatever comes to mind? After touching the Sandbox prompt in the main menu, you’ll be given a blank slate. All possible materials are at your disposal, and there are no rules (except that pesky principle of gravity). Here’s where you can really set your creativity loose. If you’re really proud of one of your creations, share it with other Apparatus players. Every time you complete a level, you can go into freebuild mode and modify the level however you like. If you make the level better, or just harder, you can upload it to the Community section and let other people play your modified level. Same goes for your Sandbox. After you’ve created something amazing, log in to your free account and share the machine with anyone else out there. You can download and comment on other players’ creations, too. Note: A minimum processor speed of 600MHz is recommended. A screen resolution of 800 x 480 or higher is recommended, as well, but the game runs on lower resolutions.